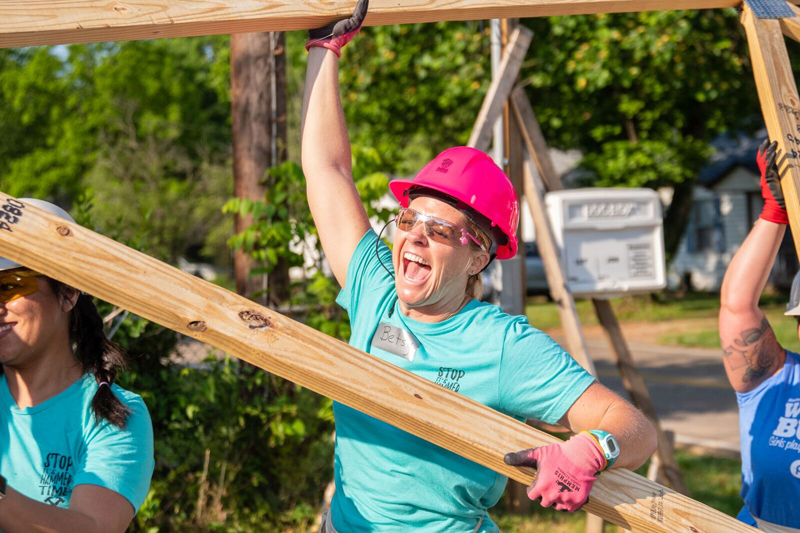 Women are the core of Knoxville Habitat for Humanity’s annual Women Build. Its motto: Girls Play House. Women Build Them. At the recent 2018 Women Build dedication event, new homeowner Deonna Evans, who cares for two adult daughters with special needs and a teenage son while also working three jobs, received her keys and became an official homeowner. Among those present for the dedication were WBIR Channel 10’s Abby Ham, Women Build Honorary Chair, and the highest fundraising team, “Stop! It’s Hammertime.” Those team members, Jessie Buttram, Susan Iglehart, Betsy Castleberry and Georgette Suggs, were presented the Diamond Hammer Award for their efforts. Team member Betsy Castleberry said, “My husband and I became involved financially a few years ago, mainly because of two people: Bob Temple, who has given so much of himself to Habitat in Knoxville, and my dad Lee Iglehart, who is on the board and really has a heart for this ministry. I started learning more about Habitat and how they give a hand up, not a hand out. I learned how the future homeowners take classes and are really invested in their future and learning how to build, not just a house, but a home for their family. When I heard about the Women's Build, I was in. Knoxville Habitat, an affiliate of Habitat for Humanity International, has built more than 560 homes in Knox County. Volunteers and future homeowners provide the labor in building the homes, while tax-deductible donations of money, land and materials are provided by individuals, organizations and corporations. Families are very much invested in the process of buying their new homes, and they pay mortgages like anyone with a traditional home loan. In addition to their mortgage, each family must contribute 500 hours of sweat equity as a down payment before they can move in. Most of the hours are spent in classes learning how to budget and become a responsible homeowner. The first Knoxville Habitat for Humanity Women Build house was completed in 1996. Junior League of Knoxville sponsored the first home. The Knoxville Women Build event then took place every other year until 2016, when it then became the annual event it is now.